Here’s the deal…We just launched a new line of camo accessories that are now available on our website. 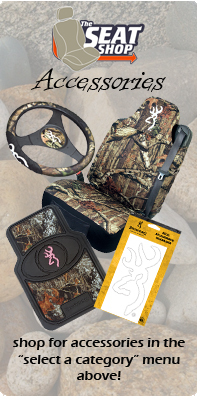 These accessories include steering wheel covers, floor mats, stickers, and slip on seat covers to protect your new leather purchase. You can find them by shopping for the year, make, and model of your vehicle. Then click on accessories in the “Select A Category” drop down menu. Let us know if you have any questions about any of the accessories, or any of our factory match replacement leather seat covers.